But Kevin Keating, Edward Mangano’s attorney, said the government’s star witness, Harendra Singh, repeatedly lied on the stand. Former Nassau County Executive Edward Mangano and Oyster Bay Town Supervisor John Venditto “traded their office for money,” a federal prosecutor said Tuesday in the 10-week-old corruption trial’s closing arguments while Mangano’s defense attorney countered that the government’s star witness “desecrated the oath” by lying repeatedly on the stand. Mangano and Venditto accepted bribes from restaurateur Harendra Singh and, in exchange, helped Singh to secure two county contracts and more than $20 million in town-guaranteed loans, prosecutors say. “They traded their office for money, plain and simple,” Assistant U.S. Attorney Raymond Tierney said in a nearly four-hour recap of the charges against the men who once served as the highest-ranking elected officials in Nassau and Oyster Bay. Tierney and Keating offered for jurors echoes of the statements, evidence and testimony they took in during the trial’s first nine weeks. “This case is about corruption and greed at the highest levels,” Tierney said, his remark sounding much like one delivered by his colleague in opening statements March 14 in the same Central Islip courtroom. 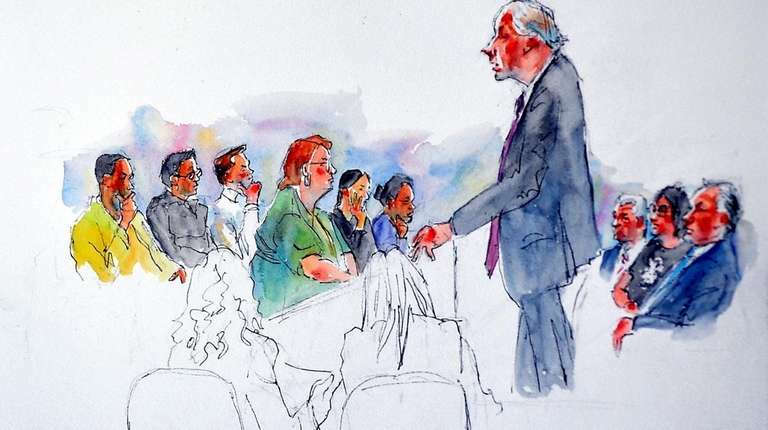 Keating — making his case to jurors after Tierney finished — discussed a bread-and-rolls contract that Singh won in 2012, saying the deal with the previous vendor could have been canceled with just 30 days’ notice but never was. His statement recalled a conversation secretly recorded in 2015 on an FBI body wire and played as evidence for jurors on March 29. 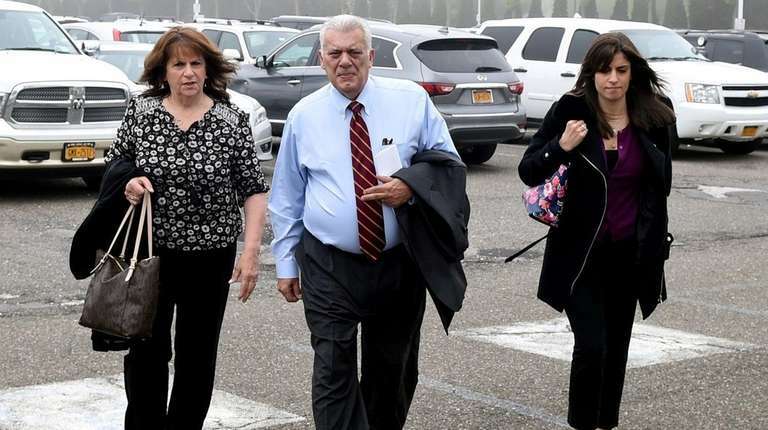 Keating is expected to wrap up his closing argument Wednesday and defense attorneys for Venditto and Mangano’s wife, Linda, also are set to make their closing cases to the jury. On Tuesday, Tierney listed the bribes that prosecutors say Mangano took from Singh, including a no-show job for his wife paying $450,000, a $3,600 massage chair, a $3,400 office chair, numerous free meals, and family vacations, on which Singh spent $47,000 while the Manganos spent $8,800. Tierney said Venditto accepted from Singh $11,400 in limousine services for himself, his family and his friends, free use of Singh’s conference room, free meals for himself and his family, and free or discounted hosting of political events at Singh’s restaurants. Tierney said Singh also gave Venditto $30,000 annually for the supervisor’s golf event. The prosecutor said Mangano and Venditto were entrenched in a “this-for-that” relationship with Singh. He presented a bill for food and catering from Singh’s company to Mangano’s campaign for $57,000 and then a check showing the campaign ultimately paid $15,000. He said testimony and a “mountain of email” showed that a contract to serve meals to county emergency workers in the wake of superstorm Sandy in 2012 was steered by Mangano to Singh. 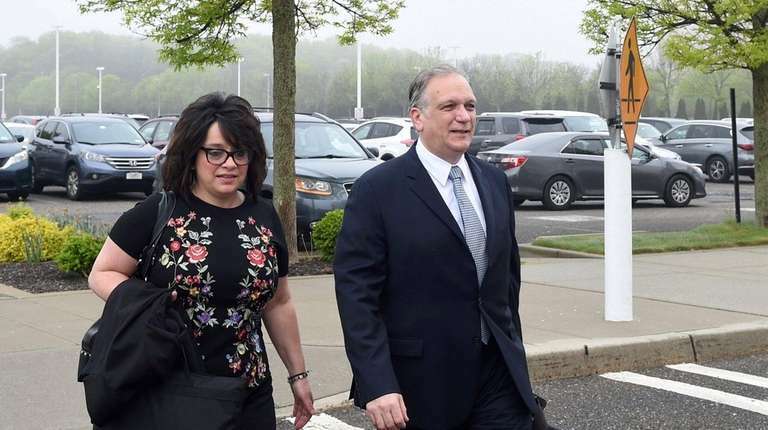 The prosecutor then referenced the crucial April 28, 2010 meeting at Venditto’s campaign headquarters in North Massapequa that was attended, according to testimony by several witnesses, by Mangano, Venditto, other county and town officials and outside counsel to Oyster Bay. Soon after the gathering, Singh would receive a $1.5 million line of credit tied to Oyster Bay’s creditworthiness, helped by Rivkin Radler LLP attorneys who had been at the meeting. It was Singh’s first in a series of town-guaranteed loans. The “crime was complete, the conspiracy has been formed,” Tierney said. Keating, too, cited the April 28, 2010 meeting, pointing to testimony by Singh that Mangano had said nothing at the gathering and that Venditto ran the meeting. The notion that Mangano was “pushing John Venditto around” after only four months as Nassau County’s executive is a “joke,” Keating said. Though Singh had testified that Mangano was silent, Jonathan Sinnreich, who was outside counsel to Oyster Bay, said on the stand that Mangano spoke at the meeting and advocated for finding a solution for Singh. Keating said Singh hired Linda Mangano upon launching a construction company that he registered as a county vendor on April 6, 2010. Linda Mangano’s first Singh check was dated April 9, 2010. Keating referenced Singh’s testimony that the construction company got zero contracts from Nassau County. But earlier Tuesday, Tierney noted that on April 13, 2010 — four days after Linda Mangano got a paycheck for what the prosecutor said was her “phony-baloney, no-show job” — Edward Mangano and William Savino of Rivkin Radler spoke by phone for 11 to 12 minutes. Mangano and Singh spoke before the county executive called his former law colleague, Tierney said the evidence showed. Who’s who in the trialKey figures in the ongoing political corruption trial of former Nassau County Executive Edward Mangano, his wife, Linda, and former Town of Oyster Bay Supervisor John Venditto. Power on Trial: Closing argumentsNeither snow nor sickness . 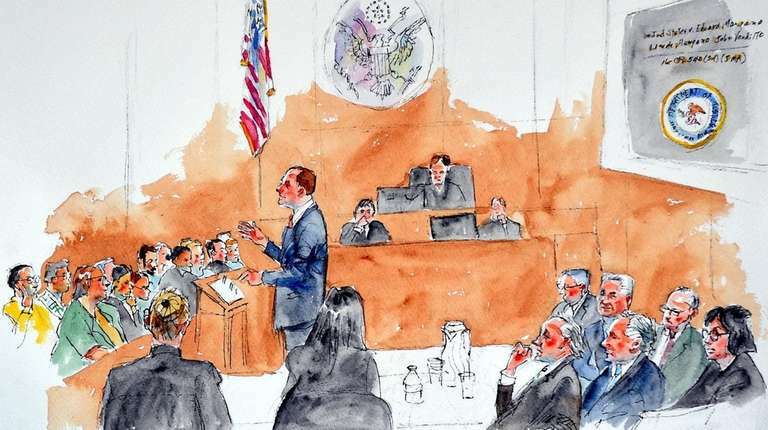 . . At 9:25 a.m. Tuesday, U.S. District Judge Joan ... Analyst: Town withheld info on Singh’s loansPatrick Strollo of Federated Investors said town officials didn't tell him that more than $20 million in loans for the restaurateur were guaranteed -- until after Strollo's firm purchased about $186 million in securities. Advisers say they didn’t know about Singh loansDonald Hoffmann, who has said he was kept in the dark for years about the millions of dollars in town-guaranteed loans for Harendra Singh, testified that he had never known a municipality to make a deal with a concessionaire before.